Ironically, My Second Act was set in motion (unintentionally) when I was just 18 years old. My father died of heart failure when he was only 50 years old. From that moment on, my adult years were fraught with the idea that life itself was done at the age of 50. I am the 8th of 10 children and my oldest sibling still had a long way to go before turning 50. However, years later when she did reach 50 and me, 41, it was a huge reality check. My life was changing faster than I could ever have imagined. My husband and I have 3 children and the plan was when they graduated from high school; they would travel to Colombia (my birth country) to study for a year. But, my oldest daughter presented us with a very long, persuasive list why the best year for her to go to Colombia was 9th grade. She was only 14 years old! We discussed the list and sadly for me, she was 100% right. I was 41 and already my time as a mother appeared to be coming to an end. My oldest daughter would be leaving us sooner than I had envisioned. My mind started to run 100 miles per hour and panic started to take over. I had studied Broadcast Journalism and Film Production but I chose to forgo my career to be home with the kids. That year, I evaluated my life and lots of questions came to my mind: what was going to happen after the kids were out of the house? I was getting older and I could not go back to television because of my lack of experience. Who was going to hire me? What could I possible work on? I had not worked in anything that I really liked, etc. I still had some time at home because the younger kids were 2 and 4 years younger, but the writing was on the wall. My process began by force and I opened myself up to finding out who I was. I sought answers to questions like how could I confront my fears? What could I do to create a better me? As time passed, I started finding more and more information about mindfulness, self-awareness and purpose. Oprah, played a big role in my search, since I arrived in US, I would watch her shows to learn English and I liked her message of purpose and meaning. Eight years later, my 7 older siblings had conquered THE number and were still alive. My time had come and the funny thing is, that year, I would not only be reaching 50 but my life was about to go through a hurricane. My husband lost his job of 13 years and was offered a job in China. CHINA! A country that I had never been interested in visiting never mind living in. I did not like anything about it, but the offer was great and my youngest daughter was not only excited but it was a dream come true for her. 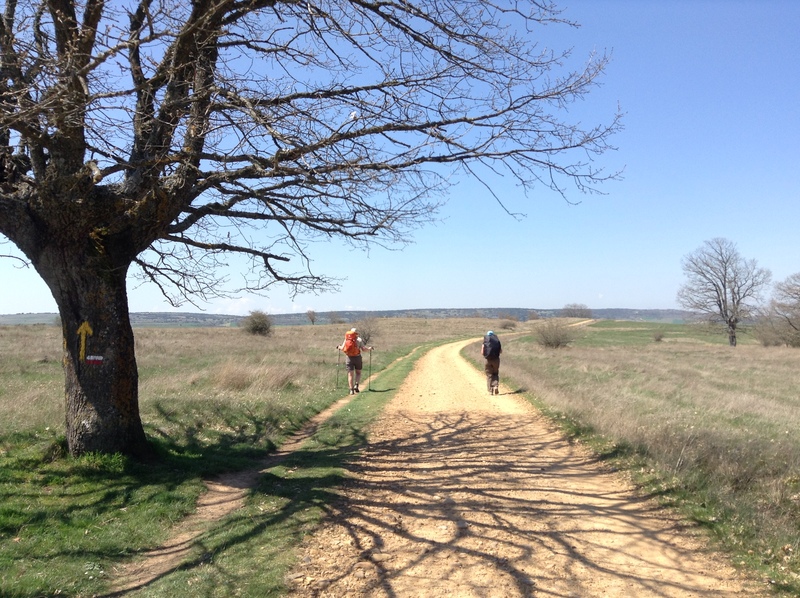 It was then I decided to walk “The way of Saint James” or Camino de Santiago de Compostela to celebrate my 50th year. It is a walk of 600 miles in northern Spain. For me it was a huge challenge, up to that day I never done anything outside because of “my allergies”. Walking the Camino meant walking 15 to 18 miles a day, sleeping in hostels or communal spaces with a bunch of strangers. Sleeping in bunkbeds that hundreds have slept in, using the same clothes for days and carrying all your needs for 30-40 days in a backpack. I did mention I was trying to face my fears; well this walk really brought me to a place of humbleness, of freedom, a love and respect for nature, people and the unpredictability life can bring. I learned to live in the moment. Little did I know that the Camino was also preparing me to survive the experience of living in China for a year. It was an experience that challenged me as a woman, as a wife, as a mother, as an individual. It was like going back to Colombia 30 years earlier. The macho culture there expected a woman to be married by a certain age, have kids, be a housewife and work to help the household but always reminding you that you were the wife of. In China, I was not allowed to be on my husband’s bank account so I had to depend on him to give me money. I was not allowed to go to my husband’s work place because it was a government building. I could not work and I did not trust what I was eating, my husband was treated like a god and I was not even acknowledged. My husband and daughter could not understand why I could not adjust to such a great experience. It was a fight to be me, without following the norms and expectation of this new culture, that as a woman, I did not matter. We came back from China after a year and our youngest was entering her last year of high school. We decided to walk the Camino for the second time with our children. It was great because it was a life changing experience for them as well. As I will always say, the Camino undressed me and dressed me again but with better and stronger clothes (metaphorically). My husband was having difficulty finding a job so I began working as an executive assistant to a friend of a friend. That is when we decided to follow our hearts and do what we had dreamed of for a long time. We took control of our own futures and decided to work for ourselves. We sold our house and started our own company; OnRway Productions. We bought a motorcycle and sidecar to travel around the US to find people who have made the decision to make a change in their own lives and in the lives of others. We are making a documentary of our travels as we cover all the 50 states. Our mission is to demonstrate the power of each person to make a change, that we as individuals can achieve anything with resolve and passion. Today, my priority is to live with passion the moment, the now. We are working hard on what we believe in, though our path is not conventional or traditional. My husband and I are 56 and 54 and l live each day with meaning and purpose. We nurture our relationship because it can be very challenging to keep the light alive after 27 years of marriage and after the children are out of the house. We enjoy each day because life presents you with the colors but if you are not aware, they can become dull. We pay attention to the people that we encounter every time because their imperfections remind us that we are all humans and we are living this life experience to grow and learn with losses and victories. My father’s early death taught me to never go to bed without saying I love you or good night to the people that matter most to you, because they could be gone in a blink of an eye. He died at 1:00 am in the morning but thankfully I was able to kiss him good night, leaving me with no regrets. My sense of purpose changed unconsciously when I was 18 and consciously when I reached 50. I loved my life before 50 but after 50, I live with the passion of a new born; innocently and without fear of the unknown. It is magical and powerful to know that fear may exist but not allowing it to control you. Now, after speaking with all kind of people, traveling the country in a sidecar, exposed to the elements, I can see life with so much love that my heart smiles of gratitude and love every new moment.